2017: THE YEAR OF OLIVER REGINALD TAMBO! A great giant who strode the globe like a colossus has fallen. The gentle voice whose measure voice of reason shook the throne of tyrants has been silenced. Oliver lived because he had surrendered his very being to the people. Nelson Mandela at Oliver Tambos’ funeral, 1993. Today marks the last day of the Year of OR Tambo. 2017 marked the centenary celebration of Oliver Reginald Tambo, the longest serving president of the African National Congress who steered the anti-Apartheid struggle through thirty years of exile. He was also a Lawyer, Co-founder of the ANC Youth League, Secretary General and Deputy President of the ANC and Head of the ANC’s Mission in Exile. Born on the 27th of October 1917, it has for long been a tradition to celebrate his legacy on the day of his birth. Just short of a year ago, in recognition of October as ‘Oliver Tambo Month’, President Jacob Zuma called on the ANC to “use the next 12 months leading to [his] centenary… to draw the best lessons from his life and to understand his rare qualities.” As a result, the year 2017 was declared the year of Oliver Tambo, a call to remember and give the deserved recognition to this hero who sacrificed three decades of his life for the freedom of South Africa. OR Tambo at the forefront of the Long March To Freedom at Fountains Valley Resort. 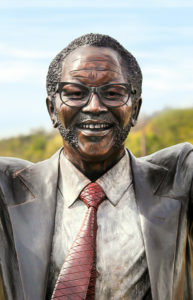 After the banning of the ANC in 1960, Tambo was sent abroad by the organisation to lead the military resistance and seek support for the struggle against apartheid. As acting president from 1967 to 1969 and president from 1969- 1991, he managed the growing number of ANC exiles and the uMkhonto we Sizwe (MK) military camps (the armed wing of the ANC). While abroad, he also raised funds for the organisation and set up ANC offices in different countries. Tambo explained the struggle against apartheid to the world, mobilising support for the struggle like had never been done before in the history of the organisation. As a result, he got a lot of support from both Eastern and Western Europe even though the two regions had opposing ideas. He was able to keep the ANC together and ensure that it remained a formidable force on the political arena even though he was in exile for most of his time as president. After the unbanning of the ANC in 1990, Tambo and his family returned to a soon to be free South Africa. His dedication to the struggle and hard work eventually led to Tambos’ health deteriorating, he refused to take time to rest in spite of suffering from bouts of illness. He sadly died in 1993, a year before democracy finally came in South Africa. Communities across South Africa are celebrating the year of O.R Tambo. As part of the celebrations of Oliver Tambo’s centenary, the South African Reserve Bank, along with South African Mint and the Oliver & Adelaide Tambo Foundation launched the Oliver Tambo centenary coins. On the 27th of October 2017, former president Thabo Mbeki will also be delivering the OR Tambo memorial lecture at the University of the Witwatersrand in honour of his priceless contribution to the struggle for freedom. The Oliver Tambo International Airport unveiled a 2.5 metre statue of O.R Tambo on the 19th of October 2017 in honour of the struggle icon. 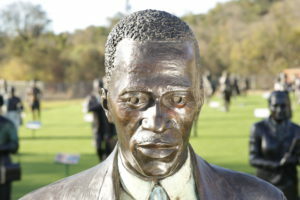 A sculpture of Oliver Tambo also stands at the forefront of The Long March To Freedom procession at Fountains Valley in Pretoria alongside stalwarts, Nelson Mandela and Walter Sisulu. This indeed is a befitting and timely tribute to such a giant in the struggle for freedom. About a year ago I was fortunate to start my career as a part-time researcher for the National Heritage Monument’s (NHM) Long March to Freedom Project. Not knowing what to expect from my position in this new and exciting project, I started off quite shy and reserved. This soon changed as my colleagues gave me the confidence to research unique yet challenging subjects. Even though my Masters research helped me to improve my researching skills, I did find that the NHM project helped me to explore other avenues of South African struggle history. As a part-time researcher, my colleagues and I were given the responsibility of taking control of the project’s social media platforms and creating blog posts that were related to the struggle icons we researched. One blog post that I enjoyed writing was the history of Imvo Zabantsundu (‘The Native Opinion of South Africa’), which was the first black owned newspaper in South Africa. I found the history of this newspaper extremely fascinating as it inspired many Africans to take pride in their culture at a time when the colour of your skin defined how you would live your life in the apartheid era. It was through researching the impact of this newspaper that it broadened my understanding of this historical period, which in turn helped me to position my Masters research differently. Since the project provided diverse yet interesting subjects, I found that there was never a dull moment. We were given tasks that always kept us busy. We were even fortunate in attending this year’s ANC policy conference, where the Long March To Freedom procession was displayed outside. Just seeing how visitors responded to the bronze figures made me value the project more. Although challenging at times I found that my time here has been rewarding as I believe that it helped me to gain experience in a more professional and demanding work environment. Today I thank NHM for allowing me to be part of their team! Adam Kok III was the great-grandson of Adam Kok I. He was the chief of the Kok clan of the Griquas and ruled the eastern Griqua at Philippolis from 1837 until the early 1860s, when he and his people trekked across the Drakensberg to found a new state in what became known as Griqualand East. After more than a decade of independence there, the Griquas suddenly found themselves taken under British control in 1874. Although he retained a measure of power, he never regained full control of the Griquas. 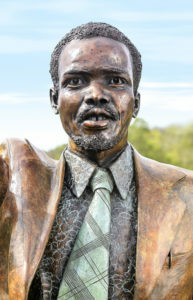 Adam Kok III was a well-loved Griqua leader who defended his dynasty against colonial encroachment in the central western regions of South Africa. No early descriptions of Kok III exist but after 1860 he was described as a kindly, astute, rather melancholic old man who was always courteous, with a particular fondness for children. Kok III died tragically in an accident in his carriage while on his way from Kokstad to Umzimkulu, signalling the end, for some, of the greatest of the many Kok chiefs. *The date of his death has also been recorded as the 31 December 1875. Christoper C. Saunders. Black Leaders in Southern African History. Heinemann Educational. 1979. Today marks 25 years since Helen Joseph passed away on the 25th of December 2017. An anti-Apartheid activist of note, Helen Joseph was arrested on a charge of high treason in December 1956, banned in 1957. She was the first person to be placed under house arrest, a sign that she was a real threat to the Apartheid regime. Her last banning order was lifted when she was in her 80th year. Joseph played key roles in the Congress of Democrats, Federation of South African Woman, UDF and the ANC throughout her political career. Born Helen Beatrice May Fennell in Sussex, England, in 1905, she graduated from King’s College, University of London in 1927 and taught for three years in India, then came to South Africa in 1931 where she met and married Billie Joseph. The 9th August 1956 was one of the most important moments of her illustrious political career, when, with the FEDSAW leaders, she spear headed a march of 20,000 women to Pretoria’s Union Buildings to protest against the pass laws. August 8 has, since then, been commemorated as South African Women’s Day. Joseph wrote three books: If This Be Treason; Tomorrow’s Sun, in which she documented her 8,000 mile search for people banished to remote regions; and her autobiography, Side by Side. Helen showed that what a dictatorial and corrupt regime fears most is not force and firing power, but the witness of people of dignity and integrity. She had no natural children, but took into her care, as her own, the children of those who were sent to prison or into exile: Nelson and Winnie Mandela’s Zinzi and Zenani; Bram and Molly Fischer’s Ilsa; Eli and Violet Wienberg’s Sheila. In the early 1960s Helen started a tradition of remembering all those in exile, in prison and those that have died in the struggle, every Christmas day at noon. Even during the years of house arrest and bans, this commemoration continued. It is therefore quite strange and sad that she died on one of her favorite days. On 23 December 1980 four black South African newspapers were banned. The four black newspapers, the Post Transvaal, Saturday Post, Sunday Post and the Sowetan, were banned on a technicality on the same day that the eight week strike of black journalists ended. These newspapers were considered to be a threat to the apartheid government as these newspapers discussed the atrocities of the apartheid regime and started reflecting their opinions against apartheid and its policies. This resulted in the newspapers becoming increasingly popular amongst the black South Africans, as it reflected the lives and views of black people under the hardships of apartheid. Due to the newspapers’ impact on the lives of various anti-apartheid groups, Justice Coetzee, who presided at the Rand Supreme Court refused to lift the banning order on the four newspapers on 29 December 1980. In addition to that, the security police served the president and vice-president of the Black journalists’ trade union Media Workers of South Africa with three-year banning orders. A storm of protest erupted, even from the strongly pro-government Afrikaans press. The banning of these newspapers and magazines was just one example of how the media had to cope with increasing numbers of laws affecting press freedom. Steve Biko was born on the 18th of December 1946 in Tarkastad in the Eastern Province (now Eastern Cape) on 18 December 1946, the third child of Mzingaye Biko and Nokuzola Macethe Duna. A radical opponent of the Apartheid regime, his death was a blow to the anti-Apartheid movement as he had become the voice of the anti-Apartheid movement in the 1960s when the African National Congress and the Pan-Africanist Congress had been banned. In August 1977 Biko was arrested together with his associate Peter Jones for being outside his district after hours and because the police had ”reason to believe” he was distributing inflammatory pamphlets. Biko had also violated his banning order as he had travelled to Cape Town from the Eastern Cape, his home area. They were arrested under Section 6 of the 1967 Terrorism Act that allowed indefinite detention without trial for the purposes of interrogation in solitary confinement. He was held, naked and with little food, in a Port Elizabeth police station from August 19 to September 6 1977. Sometime before the morning of September 7, he suffered a head injury that would eventually be cited as the cause of his death five days later. Bikos’ was the 45th known death connected with detention by the security police since 1963. In February 1999, Steve Biko’s family welcomed the Truth and Reconciliation Commission’s decision not to grant amnesty to the policemen involved in the death of Biko. The committee dismissed the application by the four former Port Elizabeth security policemen for amnesty for Biko’s death in custody. The TRC committee found that the policemen, did not qualify for amnesty because their actions in Biko’s death could not be associated with a political objective. The committee was also not satisfied that the men made a full disclosure of the facts. The panel also officially declared the next of kin of Mr Biko as victims (of gross human rights violations) in relation to his killing and therefore entitled to appropriate reparation. The committee concluded that the attack on Biko appeared to have been actuated by ill-will or spite towards him. However in 2008, AZAPO (Azanian Peoples Organisation) accused the Truth and Reconciliation Commission of not doing enough to uncover the truth behind Biko’s death. The organisation believes South Africa set a bad example to the world by not bringing perpetrators to book. On the 40th anniversary of his death in September 2017, there were renewed calls for the inquest to be re-opened in the light of the Ahmed Timol Inquest of July 2017 which was seen by some as a precedent that needed to be followed. Today marks exactly 68 years since the ANC adopted the Programme of Action. In 1943, during World War II, young members of the ANC, critical of what they considered the passivity of the ANC, formed their own organization, the Congress Youth League (CYL). Overcoming the opposition of ANC president Alfred Xuma, the CYL succeeded in 1949 in electing James Moroka to the presidency, seating three CYL members (Walter Sisulu, Oliver Tambo, and Nelson Mandela ) on the party’s national executive body, and in persuading the congress formally to adopt the Program of Action. The Youth League put pressure on the ANC leadership to adopt the Programme which included mass resistance tactics such as boycotts, strikes, civil disobedience and non-co-operation. It also stressed the need to organize African Workers into unions. Anton Lembede. Founding President of the ANC Youth League. This was to be a more radical approach to resistance, as they shunned the traditional moderate stance of ANC leaders like Xuma who believed in appealing to the conscience and common sense of the oppressive regime. This shift was especially necessary after 1948 when the National Party (NP) was voted into power by the white electorate and began implementing strict apartheid measures. The Programme of Action laid the foundation for a new era of active resistance in the form of the Defiance Campaign of 1952, anti-pass campaigns and acts of civil disobedience. On the 16th of December 1943, the Africans’ Claim was presented at the annual ANC Conference in Bloemfontein. Africans’ Claims in South Africa is the title of a document drawn up by a committee of 28 members and sympathizers of the African National Congress (ANC) and on 16 December 1943 unanimously accepted at the ANC’s annual Conference. It was created in response to the Atlantic Charter passed two years earlier, in which former President of the United States Franklin D. Roosevelt and British Prime Minister Winston Churchill set out the objectives of the Allies during the Second World War and their ideas of the world order after its end formulated. The central points of Africans’ claims were the demands for universal suffrage and for an end to racial segregation in South Africa. This document charted the path to racial equality in South Africa that they hoped would follow the conclusion of the Second World War. The full text of the document can be found on the ANC website. Today we celebrate Reconciliation Day and the history behind the holiday. The Day of Reconciliation, also previously called the Day of the Vow, the Day of the Covenant, or Dingane’s Day, is a public holiday observed in South Africa on December 16. Initially, this holiday commemorated the victory of the Voortrekkers over the Zulus at the Battle of Blood River in 1838 . Prior to the battle, the Voortrekkers had taken a vow that, if they succeeded in defeating the Zulus, they would build a church and observe the day as a religious holiday. This observance was recognised as Dingane’s Day, which was named after the Zulu King, King Dingane and was later established as a public holiday in 1910. In 1952 the National Party passed the Public Holidays Act, which changed Dingane’s Day to the Day of the Covenant and officially declared the day a religious holiday. In 1980 the holiday was changed to the Day of the Vow. This public holiday prohibited activities such as sports events and theatre performances from performing on this religious day. This public holiday became increasingly significant in 1961, when the African National Congress’ (ANC) military wing, Umkhonto we Sizwe (“Spear of the Nation”) was formed. After the first democratic elected government was established in South Africa in 1994, the holiday was officially renamed the Day of Reconciliation. This public holiday gained more attention when the Truth and Reconciliation Commission that examined apartheid human rights abuses, started their investigation in a ceremony on 16 December 1995. The 16 December is celebrated as a public holiday so that South Africans can foster a sense of national unity and racial harmony. Today marks 145 years since Dr Abdullah Abdurahman was born. 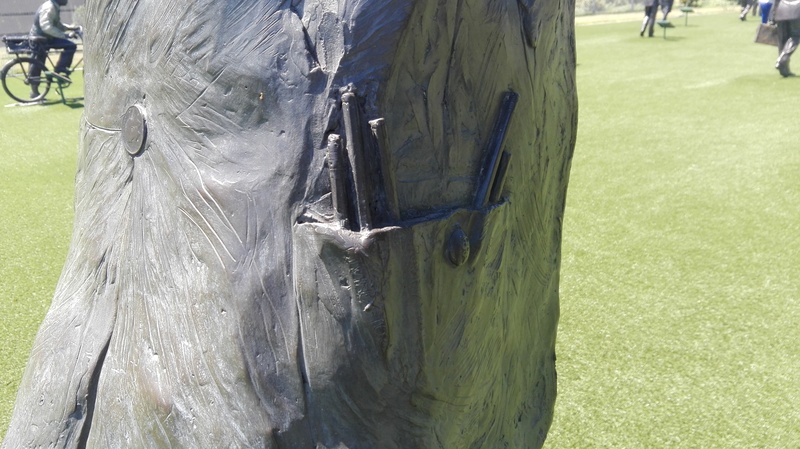 To honour this doctor, President of the African People’s Organization, Life-long member of the Cape Town City Council and the Cape Provincial Council, we would like to share the symbolism of each of the objects displayed on his #LongMarchToFreedom bronze figure. 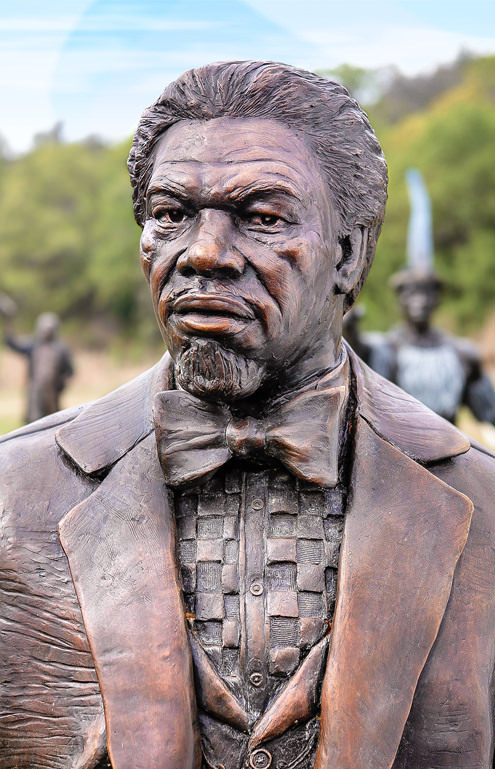 The Cross Pin on the Jacket Lapel refers to the Order for Meritorious Service where he was awarded posthumously by the President for his work “against racial oppression”. 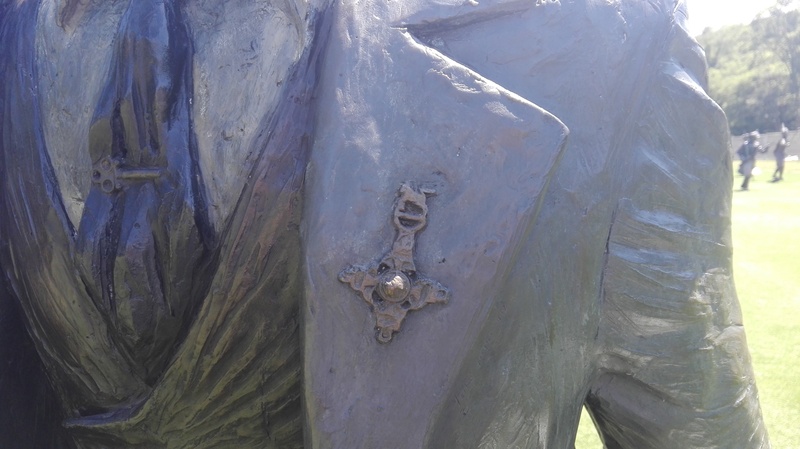 The Tie Clip in the form of a key with three loops represents a South African Police Handcuff Key to symbolise his oppression. 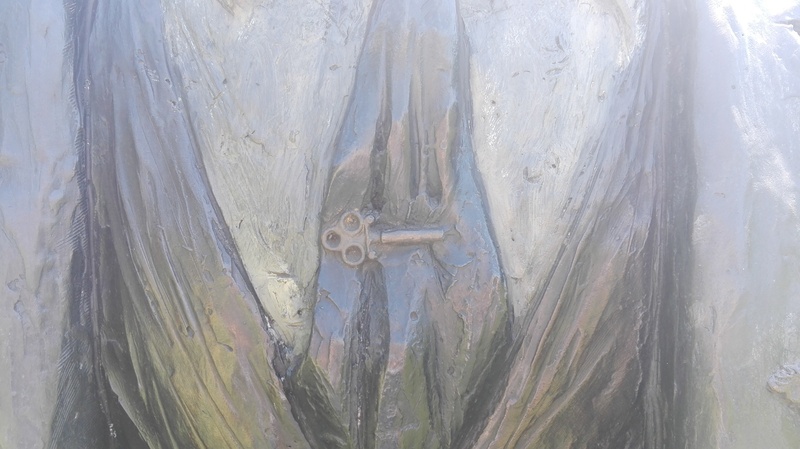 The key is further depicted in the #LongMarchToFreedom bronze sculpture of his daughter, Cissie Gool. 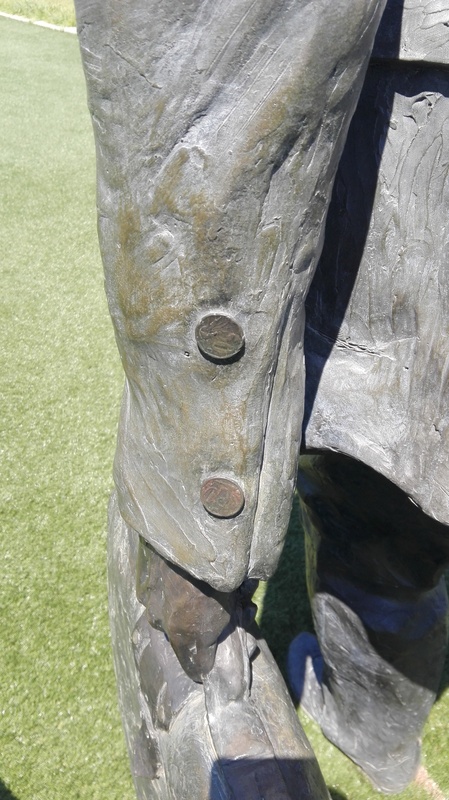 The various Coins as substitutes for buttons is symbolic of his capitalist occupations, especially in contrast with Cissie Gool’s socialist inclined ideology. 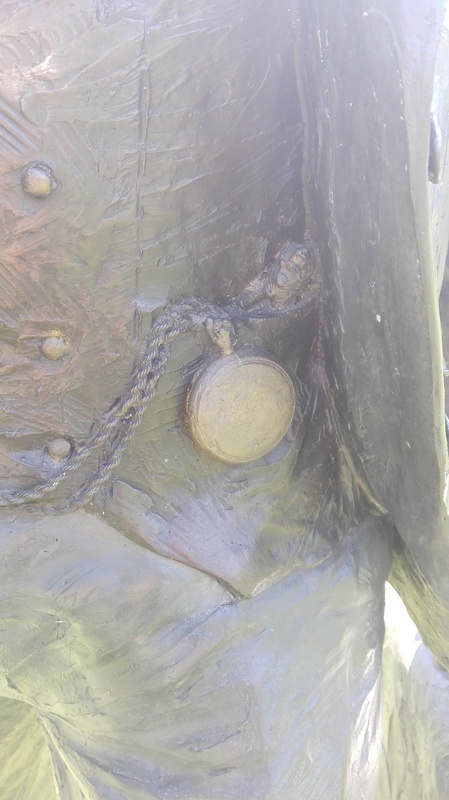 The only button not substituted has the serpent and sword insignia which alludes to his medical qualification. The 5 Pens and Pencils in his pocket reflects the 5 learning institutions and schools he established for Coloured persons. The Miniature Toy Lion in the time piece pocket refers to a toy used to entertain children as a paediatrician and general practitioner.